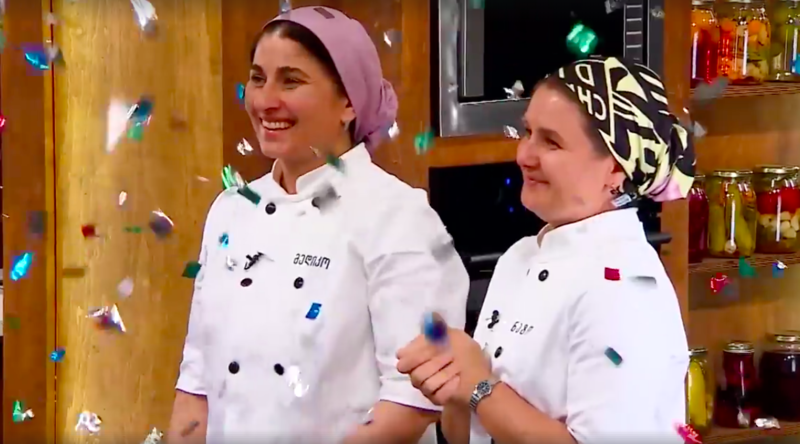 Two women from Georgia's Pankisi Gorge, Nato Kavtarashvili and Mediko Machalikashvili, winning a Georgian cooking show, "My Cuisine Rules." Two women from Georgia’s Pankisi Gorge have won first place on a popular nationally televised cooking show. The women are Kists, an ethnic minority group closely related to Chechens, and said they wanted to use the show as a platform to reduce negative stereotypes about their region and people. Nato Kavtarashvili and Mediko Machalikashvili came first on the popular Rustavi-2 TV show “My Cuisine Rules.” The duo won the title by beating out nine other teams from around Georgia; in the final they defeated a rival pair from Zugdidi, in western Georgia. ფინალურ შოუში მათ ზუგდიდის გუნდი დაამარცხეს. Both women are employees of the Kakheti Regional Development Fund in Pankisi. Kavtarashvili works with youth in the region hosting after-school courses while Machalikashvili teaches cooking classes. Pankisi has gained a notorious reputation, as some of its native sons – most notably Omar al-Shishani, an ISIS commander – have joined foreign Islamist groups. But locals say the region has been unfairly pigeonholed over the years as a hotbed of radicalism and have been seeking new ways to present the region in a more positive light. Kavtarashvili and Machalikashvili are the latest to serve up a hearty helping of Kist culture to their fellow Georgians. In the first show, they prepared the staple Vainakh dish “Jijig-galnash” – boiled meat and cooked dough dipped into garlic. Other dishes on offer were Chechen halva and “ajapsandali” – a meat and vegetable dish popular around the Caucasus. The duo saved their best dish for the final round of the contest. The women said they have yet to decide what to do with their 100,000 GEL ($41,000) prize money. Bradley Jardine is a freelance journalist who covers the Caucasus.